Have a 1952 penny and want to know what it’s worth? You may be in luck, as some 1952 pennies have values ranging into the hundreds of dollars… even thousands! Other 1952 wheat pennies are worth only a few cents. So how do you know if your 1952 wheat penny is rare and valuable or worth little more than face value? How Much Are 1952 Pennies Worth? The most valuable 1952 wheat penny sold to date is a Philadelphia (no-mintmark) issue certified by Professional Coin Grading Service (PCGS) and graded Mint State-67 Red — which is a nearly perfect penny with original color that looks about as new as the day the coin was made! The record price paid for this coin is $9,775. 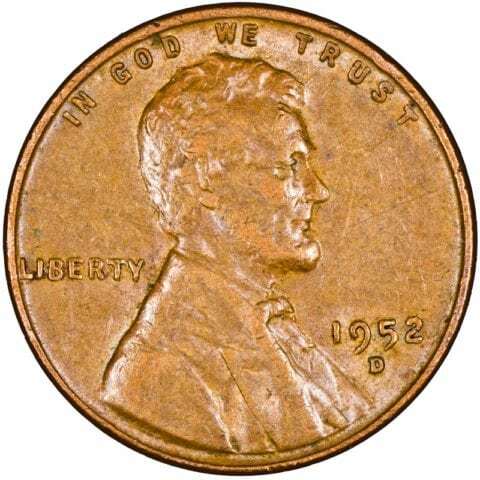 Chances are your 1952 penny isn’t worth nearly as much — especially if it was found in your pocket change and has some wear from being in circulation. But you’ll be glad to know that even the most well-worn 1952 wheat pennies are worth more than face value! How Much Is A 1952 Wheat Penny With Errors Worth? There are many kinds of 1952 penny errors, including doubled dies, repunched mintmarks, off-center strikes, and other error oddities. Doubled Die vs. Machine Doubling: You may have heard of doubled die pennies (some mistakenly call these double die pennies) and probably think you have one if any part of the coin appears doubled. In most cases doubling is caused not by a doubled die but machine doubling — which is a non-valuable strike defect and not an error. The 1955 doubled die penny is one of the most valuable coin errors around — and many people are aware of it. But not all doubled die pennies are worth big bucks. Doubled die coin values largely depend on how scarce the variety is and how much demand there is for it by collectors. In the case of 1952 doubled die pennies, they generally aren’t as much in demand as the 1955 error penny, but that doesn’t mean 1952 error pennies aren’t worth looking for! Many are rare coins that are much scarcer than the 1955 doubled die penny — it’s just that fewer collectors know about them. There are always new errors and varieties being uncovered, even on old pennies. So, don’t give up on looking for cool error coins. You may just discover a new error on an old coin! How Many 1952 Pennies Were Made? 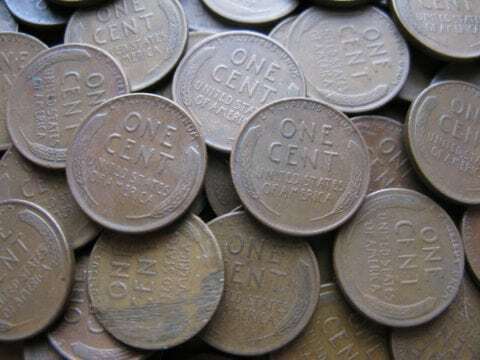 More than 1 billion wheat pennies were made in 1952. NOTE: These numbers are official production numbers (or how many pennies were made). A great deal of the coins reflected in the numbers above — perhaps most of the circulation (non-proof) strikes — have been damaged, lost, melted, or otherwise no longer exist. Thus, the number of surviving 1952 pennies is actually much scarcer than the above mintage figures may suggest. What Else Happened The Year Your 1952 Penny Was Struck? Elizabeth II became the Queen of England and United Kingdom on February 6, following the death of her father King George VI. Her coronation followed in June 1953, and her likeness has since appeared on billions of coins struck for Great Britain and other Commonwealth nations. Smog in London killed more than 4,000 people during a 4-day period — leading to effective anti-pollution laws in Great Britain and inspiring other big cities around the world to adopt similar measures. The polio epidemic soared, killing 3,000 and disabling more than 55,000 others. In a few short years, Jonas Salk developed the polio vaccine with funds raised by the March of Dimes organization. The Today show debuted on NBC and became one of the most popular morning news and entertainment programs. Mr. Potato Head, a toy figurine with comical interchangeable faces, arms, and legs, was released to the delight of millions of children. Holiday Inn, one of the world’s most popular hotel chains today, opened its first location in Memphis, Tennessee. Among the top TV shows in 1952 were I Love Lucy, The Colgate Comedy Hour, The Jack Benny Program, The Milton Berle Show, What’s My Line, and The Adventures Of Ozzie & Harriet. The most popular movies in 1952 included Singin’ In The Rain, High Noon, Monkey Business, The Greatest Show On Earth, The Quiet Man, and The Big Sky. Top-charting songs in 1952 were “Blue Tango” by Leroy Anderson, “Wheel Of Fortune” by Kay Starr, “Cry” by Johnnie Ray, “You Belong To Me” by Jo Stafford, and “Auf Wiederseh’n, Sweetheart” by Very Lynn.